Whitfield Reaves has been in the clinical practice of orthopedic and sports medicine acupuncture since the early 1980s. His mission is the integration of traditional Chinese acupuncture with anatomy, western orthopedics, and sports medicine therapeutics. Whitfield was among the first acupuncturists in North America to specialize in sports acupuncture using anatomically-based assessment with Oriental treatment protocols. For 30 years he has been an instructor and a mentor to other practitioners in the acupuncture profession, helping to define the speciality of Acupuncture Sports Medicine. Whitfield regularly teaches seminars and workshops in the United States, Canada, and Europe on the treatment of sports injury and pain. Whitfield Reaves, OMD, LAc, is a nationally certified acupuncturist, and has been in clinical practice since 1981. He received his Doctor of Oriental Medicine (OMD) degree in 1983. His thesis, titled "Acupuncture and the treatment of common running injuries", was one of the first-ever English language works integrating traditional Chinese acupuncture with western orthopedic and sports medicine. Whitfield's clinical experience includes medical care for athletes at the 1984 Olympic Games in Los Angeles, as well as track and field, skiing, cycling, and triathlon events nationally over the last 30 years. In addition, he is the author of The Acupuncture Handbook of Sports Injuries and Pain, one of the only texts on sports acupuncture available in the West. WHAT IS ACUPUNCTURE SPORTS MEDICINE? 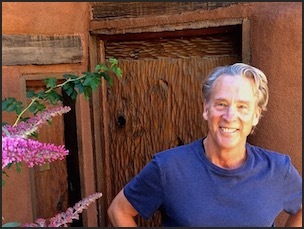 Whitfield Reaves started practicing acupuncture in 1981, graduating from the first college approved by the Medical Board in California. As an early practitioner, most of the educational process was dominated by traditional Chinese medicine and its centuries-old roots in Asia. In the early 1980s, there was very little attempt to understand acupuncture theory and practice outside of the model of the classic texts. ￼But from his first days of practice in late 1981 through the Los Angeles Olympic Games in 1984, Whitfield treated elite athletes from the US, Canada, and Europe. These world-class competitors required modern explanations for their treatments. It was essential to include western anatomy and physiology in the interaction with these patients. Thus, his system of anatomically-based treatment protocols developed from this clinical sports medicine setting. For the 30 years since the 1984 Olympic Games, the system of diagnosis, assessment, and treatment that is loosely termed Acupuncture Sports Medicine has been continually refined and re-evaluated. And all of this within the mission of integrating traditional acupuncture with western orthopedics. The result provides a brilliant yet simple system of acupuncture appropriate for patients who experiences injury and pain. 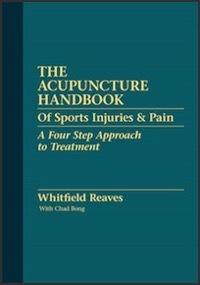 After 25 years of experience in the clinic, Whitfield Reaves completed his first book, The Acupuncture Handbook of Sports Injuries and Pain. Published by Hidden Needle Press (2009), it is among the only texts that emphasize western orthopedic and sports medicine within the context of Chinese acupuncture practices. The Acupuncture Handbook is available on this website, as well as major distributors nationally. It is designed as a clinical manual for health care providers who use acupuncture in the treatment of injury and pain. Whitfield Reaves has been teaching acupuncturists and other health care practitioners for 30 years – ever since graduating from his formal training in 1981. In 1986, he taught one of the first courses ever offered in North America on sports acupuncture, thus emphasizing the necessity for specialization in the profession. This seminar, and his programs since 1986, include protocols such as trigger points, motor points, and the needling of anatomically significant tissues of the body. Whitfield's work has been a significant contribution to the treatment and management of pain in the acupuncture community. Currently, his "flagship" course, The Acupuncture Sports Medicine Apprenticeship Program, emphasizes a small group mentorship-style learning environment. He insists that this is the "traditional" way to teach Chinese medicine, and if offers a personalized setting to learn the skills of assessment and palpation, and master the precision of needle technique.